Megakaryocytes (MK) are hematopoietic cells present in the bone marrow that are responsible for the production and release of platelets in the circulation. Given their very low frequency (<1%), human MK often need to be derived in culture to study their development or to generate sufficient material for biological studies. 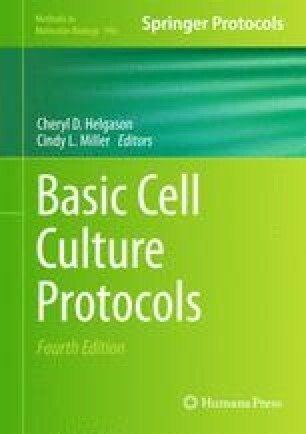 This chapter describes a simplified 14-day culture protocol that efficiently leads to the production of MK and platelets from cord blood enriched progenitor cells. A serum-free medium is suggested for the growth of the CB cells together with an optimized cytokine cocktail developed specifically for MK differentiation, expansion, and maturation. Methodologies for flow cytometry analysis, MK and platelets estimation, and MK progenitor assay are also presented. This work was supported in part by a National Blood Foundation Grant. A. Robert was the recipient of an Industrial R&D Fellowships from the Canadian Natural Science and Engineering Research Council.